Dairy producers and the breeding industry have recognized health, well-being and long-term fitness of cattle as economically important. For cows to achieve a productive life, they must calve early and calve often, but they must keep on living. By having the highest rate of 'staying in production' and the lowest rate of 'removal', Jerseys can live up to their owners expectations. Attributing to a productive life is the health of the animal. Reproductive performance, clinical mastitis, disease, injury, and feet and leg problems all significantly influence herd longevity and culling. Numerous reports in both Canada and the United States have shown Jerseys to have superior figures for productive life, meaning lower replacement costs, more calves born on the farm, and greater flexibility to either improve the herd through voluntary culling or to make replacement heifers available for sale. 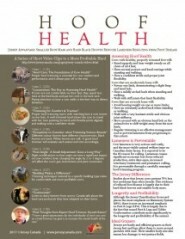 All dairy cattle benefit from hoof care and in many cases, cow lameness is preventable through a carefully managed hoof-trimming program. Jersey Canada has eight video clips available to you on this subject. Dairy cow lameness causes significant economic loss from reduced production, extra days open, increased veterinary treatments and premature culling. A University of Iowa field study found that while 90% of the Holsteins examined in the trial showed evidence of foot lesions, only 19% of Jerseys had signs of foot problems. The Jersey’s hard black hooves make her less prone to foot infections such as hairy heel warts. Once again, size matters, as her smaller body mass reduces lameness resulting from foot disease. Although the Jersey Classification Scorecard places the most emphasis on Mammary System (48%), there is now an increased emphasis on Feet & Legs (18%). This is largely due to the fact that sound Feet & Legs and Udder Conformation contribute most significantly to the longevity and profitability of the animal. Jerseys are also hardy and efficient grazers as their strong feet and legs allow them to move around pastures with ease. Their smaller body size also means less damage to wet pasture fields. There are many advantages to having Jerseys in your herd. But the primary reason is to enhance the quality of your production - protein and fat - and get paid for it. Jerseys are smaller, use fewer natural resources, convert feed to milk with less investment, and produce a smaller carbon footprint. They have a longer productive life that produces a more nutrient-rich milk that fits perfectly with the type of dairy products that consumers want. Jerseys are trouble-free, and in increasing numbers, commercial producers are choosing Jerseys because they calve earlier, stay healthier, breed back sooner and produce a higher value product. Jerseys are the perfect breed for these times. There are many advantages why producers are adding a touch of colour to their herd or expanding their Jersey stock, and many are even changing completely over to Jerseys. Learn how the Jersey breed is meeting the expectations of their owners.